"The Green Weenie was developed by Ken Igo and Russ Mowry ..."
The Green Weenie was developed by Ken Igo and Russ Mowry of Westmoreland County, PA. The late Russ Mowry was Fred’s brother-in-law, friend, buddy, fishing companion, and mentor, teaching Fred the fundamentals of fly tying and fly fishing more than 50 years ago. Fred introduced the Weenie to South Central PA and the popularity of this simple fly has spread rapidly throughout the country. Probably, this is due in no small part to Charlie Meck’s book Pennsylvania Trout Streams and Their Hatches, in which he talks about first using it while fishing with Russ Mowry in Western PA.
As the fly is very effective on brown trout, though other trout will hit it, Fred figured something red would work even better for rainbows and brook trout. He found that when tied with fluorescent fire orange chenille, the Red Hot is to rainbows and brooks what the Weenie is to browns. 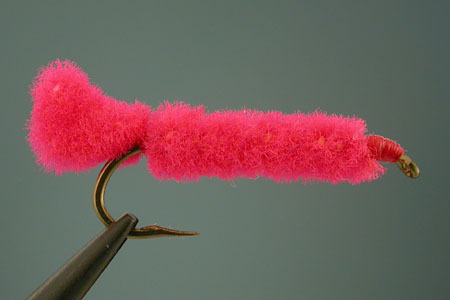 By the way, tied on #6 or #8 long shank salmon hooks, both flies will take salmon from the upstate NY rivers. Hook: Size 12, Mustad 79580. Tail: 1/4" loop of chenille. 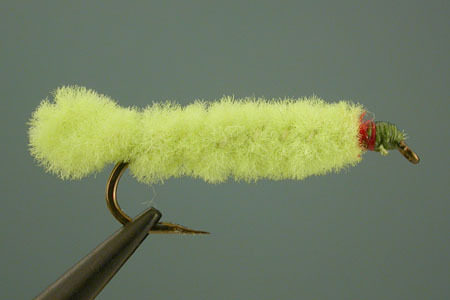 Body: Chenille wrapped up the shank and tied off. Head: Thread wraps completed with whip finish and cement.